I haven’t been online the last couple of days, I was back online this morning with a Halloween update and some random silliness (because that’s what I do best, lol). I am sooo behind on visiting my bloggy friends, I haven’t forgotten about you and I look forward to catching up! I also had some new visitors this week and am excited to check out your blogs! Hopefully this weekend. The other night, Little Bitty treated us to a middle-of-the-night meltdown, from about 2-4am, complete with wrestling match(es) and screamfest. He had fallen asleep on the couch as soon as he got home from school that day and despite repeated attempts to wake him up he wouldn’t, so we put him to bed around 8pm. He woke up around 10:30pm and was still tired but didn’t want to stay in bed so he sat on my lap on the couch until about 11:30 when we were ready for bed (we were tired too). He was not impressed about bedtime, and his screaming actually woke Cuddlebug and Bearhug up (usually they sleep through his shenanigans). We heard noise in their room and went to check on them, only to find them both in the closet, halfway dressed. Apparently they heard commotion and thought it was time to get ready for school, lol. We told them it was still night time and to go back to bed. In an effort to keep him quiet so they could sleep, I took Bitty downstairs and tried to get him to eat. He was ok for a while but decided he wanted a cookie and the injustice of being told “no” set off the mega-meltdown. He hasn’t figured out that sometimes even if you ask nice (which he did at first) the answer is still no. I had already let him have a couple of cookies earlier in the evening (because he asked nice and it’s tough to say no to that face!) but I didn’t want him eating cookies at 2am so that time I said no. So much for keeping him quiet. Within a few minutes I got the feeling that (as usual) the cookie was long forgotten, he just wasn’t happy and wanted to make sure everyone within a 50-mile radius knew about it. If it hadn’t been the cookie that set him off, it would have been something else. Finally got him calmed down at nearly 4am, he wouldn’t go to bed though so I took him downstairs and we ended up sleeping on the couch for what was left of the morning. Ahh… the 3am meltdown, fun times. Sigh. At least this kind of thing is getting less frequent. Or maybe I’m just blocking it out of my memory more effectively, haha. On a funny note, he was cute earlier in the evening, he was eating his cookie and singing “da pah ma tu-ee” (there’s a party in my tummy). It’s another Yo Gabba Gabba song, meant to encourage eating vegetables, but it works for cookies too I suppose. He smiled really big when I figured out what he was saying J. Also this week, we celebrated dh’s birthday, with ice cream cake (yum!!). The boys were all excited about that. Bitty even managed to feed himself *with* a spoon. *Without* turning the spoon over. I was impressed! Usually he has a hard time with spoons, he scoops the food and then turns it upside down on the way to his mouth, spilling the food, and then he gets annoyed when the spoon is empty by the time it gets into his mouth. So that’s our progress of the week! This morning, Bitty’s school had a petting zoo come to visit, so dh joined them and took some pictures of Little Bitty with the animals. He said he wasn’t shy at all, sounds like he had a good time J. I can’t wait to see the pictures! I’ll be sure to post some here too when I get a chance. I thought I'd let you know that I have an awesome book giveaway happening at my blog right now in the name of SPD awareness. 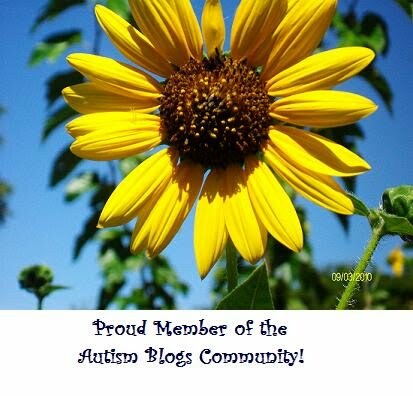 I found your blog via Elizabeth Channel's blog links. The books I am giving away are books for children about SPD, written by a mom to a daughter with SPD. Her daughter helped to illustrate the book. I have five signed copies to give away. If you're interested, please come by and see what it's all about! Happy birthday DH. Carson has that same problem with the spoon thing. We are working on that and several other problems due to SPD. So maybe one day. I have been sleep deprived as well due to Carson's asthma. It is really out of control right now and I'm hoping for break. He has surgery on Halloween so I'm praying that will fix all of his problems. Anyways, just wanted to stop by and wish you a great weekend. Boy, you have been busy! I am so far behind in my blogging reading also! I don't know where the days go. I've been trying to get caught up all day long and have barely made a dent in my reader. Our 6 year old is pulling some night time melt downs. Not as loud, but just as frustrating. I have very little patience at 3:00 a.m. I hope you get caught up on sleep soon.